I was delighted to read in Eureka Street Ruby Hamad’s passionate protest that she and other Muslims should not constantly be called to account for the vicious behaviour of IS. Still less to be stigmatised until unnamed Muslim leaders disowned it. I was disconcerted to see so many Eureka Street readers appeared to agree with the demands against which she protested. Both Ruby’s complaint and the responses to it reminded me of the attitudes taken to Catholics in an earlier generation. The popular charges against Catholics were honed in the Great War and particularly by the referenda on Conscription. They combined suspicion of anything Irish in the aftermath of the 1916 Uprising and more traditional judgments of Catholics on the basis of their beliefs and practices. The case went something like this. The Uprising was seen as a traitorous blow to the English war effort which indicated a broader Irish disloyalty to the Crown. Archbishop Mannix’s leadership of the opposition to conscription and his outspoken criticism of the treatment of Ireland by the English Government fuelled further attacks on the patriotism of Australian Catholics, most of whom were of Irish descent. This charge echoed the broader historical attack on Catholics in England that their subjection to the Pope was incompatible with their loyalty to the King. So they and their Bishops were called on to declare their loyalty. Of course, the fire was also fed with other dried out chestnuts. Catholics, after all, were responsible for the Inquisition, the Crusades, the St Bartholomew Day Massacre, witch burning, the later Falangist regime in Spain, and other Evil Acts. Their leaders were called on to abjure them, too. Totally and repeatedly – no room for muttering about historical context. And of course then there were such Evil Catholic Practices as clerical celibacy practiced publicly on the city streets, clerical tyranny as displayed by a lunatic parish priest in Bandiwallop West, the ringing of the Angelus bells early in the morning, running their own school system and having the temerity to expect that good Australians would tolerate being nursed by Catholic Nuns during the flu epidemic. And then there was Papal Infallibility, which meant that all Catholics were bound to accept every Papal statement, no matter how taken out of context. Since these included Papal condemnation of charging interest on loans and of democracy, Australian Catholics were also demanded to abjure these statements that subverted the Australian way of life. And so it went on. This anti-Catholicism as I knew it from family stories, personal experience and reading, was only a ripple from a stone long since thrown into the water. It was not shared by most Australians and was no more than an irritant in daily life that was vanquished every time a Catholic boxer beat up his opponent, Catholic footy clubs thrashed those run by the Masons, and my school team beat the Nobs. 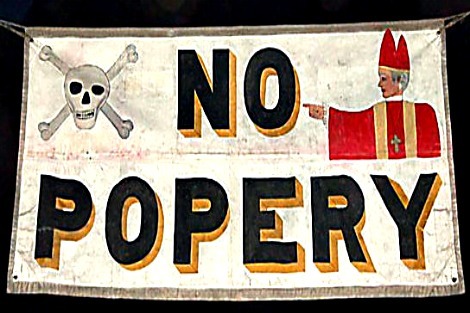 Of course, Catholics responded with anti-English and anti-Protestant prejudice, demanding that English non-Catholics agree to returning Our Churches and repent of the wrongs done to Ireland. It was only later that I worked out what was going on. In times of anxiety some people identified Catholicism and the Irish people in which it was embodied as Evil. They justified that belief by finding texts to which they gave decisive authority that commanded unpatriotic and brutal actions. They then postulated that all Catholics gave those texts the same authority that they themselves gave them, and must be in favour of brutal and unpatriotic attitudes and brutal actions. That allowed them to ostracise individuals and whole communities on the strength of being Catholic. Our stigma could be washed off only when the Pope and Bishops around the world repented again and again of their beliefs and condemned every outrage committed by the Irish or Catholics generally. I thought then, and think now, that it would have been nice if people chatted with local Catholics and asked us what we believed instead of telling us. But that was not how it worked. Anti-Catholicism like anti-everything-else, still exists in pockets. Now Anti-Islam is all the go. It works in the same way. People attribute Evil to a religion and to peoples who embody it, confirm their prejudice with selected texts, make these texts central for all Muslims, and hold communities and individuals, whether secular or religious Muslims, accountable for the evil done by other Muslim groups unless they provide them with authoritative disclaimers. All is done from a pulpit high above the people talked about. So we Micks who remember our own history know what you experience, Ruby. We share your outrage and admire your courage in voicing it. We would have liked to invite you to join the club. But in Australia today you, not we, are the club. I appreciate that Fr Andy is attempting to assist a fellow writer who feels that she is unjustly tarred with the same brush as the IS Terrorists. However, I feel that Fr. Andy's defence falls a little short of the mark and does not give the respondents' comments to Ms Hamads' article due credit. Several respondents cited the fact that there is a deep concern about persecuted non-Muslims in Majority Muslim States, which cannot in any way be compared with the plight of Muslims in majority non Muslim countries like our own. The Islamic theology towards the fate of the infidel (or kafir) is generally not conciliatory (there is no equivalent of baptism by desire in Islam, whereby in Catholicism, non-Christians can be saved), and therefore persecuted non-Muslims are dependent on the goodwill of moderate Muslims to provide the necessary conciliation. For a respected figure like Ruby to wash her hands of the issue is simply not an option. Also for the record, the Uprising in Ireland was in 1916, not 1915. To compare anti-Islam to anti-Catholicism fails to really hit the mark, and is not comparing apples with apples. The ink hasn't even dried on our history, Andrew, and we have forgotten it. It really is distressing to note that many of those now vilifying Muslims are the grandchildren of Irish Catholics who once suffered the same treatment. I feel sure they have no idea of what their grandparents had to endure. It is ridiculous to conflate irrational anti-Catholicism of yesteryear with today’s valid concerns about Islamic violence. Of course the majority of Muslims are peaceful and decent citizens. However over the last two decades 99 per cent of terrorist murders have been committed by Islamic militants in dozens of countries worldwide. In France over 750 Muslim neighbourhoods are now officially designated as no-go zones by the French police, and other European countries have similar problems. It was the heads-in-the-sand politically correct brigades who were responsible for the horrific sexual abuse of children in Rotherham, UK, where about 1400 children were raped and sexually abused over a 16-year period, often by gangs of older men. According to the Jay Report, the authorities constantly underplayed or ignored the problems, and the reason was because of the race and religion of the perpetrators; the majority of perpetrators were Pakistani Muslim men, and the vast majority of their victims were poor working class white girls. This elevation of offence-avoidance above truth occurs because of people wanting to be seen to be tolerant rather than doing what was right. But that is nothing more than the vices of Pride and Cowardice at work. Ruby Hamad is to be commended. As an Alawi, a member of a group on the islamic State's "exterminate now" hit list, she could quite easily claim she was "different" and join in the hate campaign against what is, basically, a deviation from Sunni Islam. I am surprised, so far, no member of the Saudi ulema has come forward to condemn IS's deviation from orthodoxy and to label them "kafir" (unbelievers). This tells me a lot about the Wahhabi creed of Saudi Arabia and its hierarchy. Perhaps there is a certain ambiguity about this stance? Whether Islam is a religion of peace or a religion of war, the evidence being the early, more "spiritual" suras in the Quran against the later, more "earthy" revelations when the fugitive community was established as the ruling elite in Medina with the Prophet as Imam (Head) of both Church and State combined, is an argument you have to know an awful lot about Islam to participate in. Most ES readers would be right out of their depth here. IS has radically changed the situation. Good, believing Muslims, who are no threat to anyone, like Irfan Yusuf, or heroic opponents of IS and all it stands for, like Jamal Rifi, have spoken. They need to take the lead here as part of the ongoing dialogue. Good article but I find the last paragraph a bit Polyanna. It shocks me to see repeatedly how many Catholics have forgotten this part of our history. Andrew, as always this is absolutely brilliant. In many ways, there are strong parallels between antisemitism among Christians for the past 2000 years, Islamophobia in the West since the rise of Islam, and anti-Catholicism in the English-speaking world since the Tudor era. Not being either a Jew, a Muslim, or a Catholic myself, I believe it's up to guys like myself to take the lead in challenging this bigotry, rather than members of the groups who are the objects of the bigotry. Thank you Andy! I teach English to refugees, most of whom here are Muslim. In conversation a little while ago, one of them from Pakistan said that groups like ISIS and the Taliban claim to be Muslim - But They Are Not! All the ones I know are lovely; but if course, I talk to them! I think it may be helpful if Muslims condemned terror simply,unequivocally and often, so as to create and confirm a culture of non-acceptance of violence, that may penetrate the minds of their mis-guided youth and the mis-guided critics of Islam. I too remember those times, as a very young protestant I was appalled then as I am today. Anxiety can be a justification for worry but not for forgetting; the new commandment to love God, to love our neighbour as we love ourselves. This is a painfully apposite article. Through university classes I have worked with many Muslims from many different places. Their faith is reflected in their lives and interactions in multiple and enriching ways. For them to be stigmatised for the actions of a few is unfair and unworthy of us as an immigrant, multicultural society society. Ten years or so ago when some people in classes began criticising Islam in florid terms I found myself saying something like you have said. It is appalling that it still needs to be said. Thank you again. PS I am neither a Catholic nor a Muslim. A thought-provoking article; well done. A problem of course is that there ARE significant amounts of truth behind many inter-community fears and hostilities, including all those nasty things you mention that the Catholic Church really has done over the years to many, not to mention the heap of nasty things Islam has done including to Christians (and probably to a lesser extent vice-versa).The Irish DID have an up-rising against the British in 1916 , the year of "the Somme" etc (and one suspects with a lot of emotional sympathy among the Australia-Irish generally). So there is very frequently some or even a lot of truth behind "bigoted" feelings and painful personal and inherited psychological wounds that are easily opened up. And the Germans did do some pretty bad things in Belgium in August 1914, including burning down Louvain and its Catholic University. As an aside, Crown Prince Ruprecht of Bavaria who very effectively commanded the German 6th Army, including against Australians, was the hereditary pretender of the Jacobite cause and a very good Catholic...the Brits seemed to miss that in 1914! The point i suppose is that people are complex and the realities of not only their experiences and realities but those of their ancestors have to taken into account in understanding them. And it is important to understand why people react in the way they do. I feel your historical analogy is more than a little flawed, Fr Andrew, and thus quite invalid. Unlike Catholicism in Ireland under the invasion of Protestant English rule (and the run-off from that in Irish migrant communities in British controlled colonies), the Muslim community in Australia is not living in its homeland, invaded by the Christians and thus moved to murder in defence of their rights and religious heritage. Your argument is the simplest of logical fallacies- non sequiter. An excellent article, the forc eof which as increased for me by having watched 'Living with the enemy' on SBS last nigh. The onus should not be on the majority of Muslims to 'prove' over and over that they are not terrorists. Father Hamilton SJ, Anti Catholicism is no mere antiquity of "earlier generations". [Charles Chiniquy.Maria Monk et alii. Thanks for a timely and cogent reminder that the targets of fear and loathing shift over time. Historical amnesia is rife, as is the refusal of many people, including some who comment in these pages, to see parallels. I have lived long enough to experience the creation of several categories of enemies, and, over time, the eventual incorporation of them into the mainstream, after which too many then join the majority in denigrating and excluding a new 'Other'. I hope more readers will take this history lesson to heart and reflect on their own prejudices. Thanks Andrew. I understand that when it is suggested to people with "a drinking problem" that they attend meetings of Alcoholics Anonymous they are advised to "look for the similarities not the differences" in the stories that recovering alcoholics share at meetings. People who have no desire to stop drinking see only the differences not the similarities. Those who do want to stop will recognise their own drinking experiences in the stories told This may not happen right away but eventually the penny will drop. They will admit they too like the speakers are powerless over alcohol and if they want to live happy and productive lives they must stop - completely. My take on Andrew's article is similar to the AA advice. If I can look at the similarities between the way Muslims are being treated in Australia with the way Catholics have been treated in the past, then I might have more identification with their plight and be willing to reach out to them in friendship and understanding. "We fervently wish to have a frank conversation with all people of good will,..., even those who hate the Church, so we can build peace with all" Gaudium et spes.. I've often thought of this parallel between present 'Islam' and past 'Roman Catholicism' in Australia. Islamophobia has the same agenda of collective blame as 'No Popery'. In West Wales when the IRA killed Lord Mountbatten in 1979, the local paper ran the sub-header 'Pope must act now'. According to the Bible, the first Words God spoke, and thus the First Commandment ever given, were 'Fiat Lux' 'Let there be Light'. Billions of years later the Sun formed, giving off the photons we see as light. Billions of years later again the human mind evolved, and by its light we can see what is needed for all the human race to live in peace and harmony, for the benefit of all concerned. All we have to do is curtail the impediments that block that light and allow it to shine in the dark places of our souls that give birth to the prejudices and intolerance that blight our lives. We are going through difficult times. It is very important that we stay calm, but we must be vigilant. We are Christians, and we should instruct our selves about the teachings of Islam. Read the Qur'an and Hadith in English, there are many books written by Christian converts from Islam who are experts on the Qur'an. Then we will understand what is wrong with the world. Sadly it may be too late. Ron Cini gave very sage advice when he wrote that we should read the testimonies of converts from Islam to Christianity. The following youtube video from a former Muslim, "Brother Rachid", makes compelling viewing IMHO. https://www.youtube.com/watch?v=QxzOVSMUrGM The video's title is "A Message to President Obama from a former Muslim". The grave problem that many people refuse to face is that the Qu'ran and Hadiths contain multiple passages that can in no way be seen as anything but calls to brutality and violence. The "taken out of context" defence does not wash. The first biography of Mohammed by Ibn Ishaq's tells of him leading battles and ordering his men to decapitate captives. There are no such passages in the New Testament. The twisting of individual verses from the New Testament to justify violence and brutality are obviously not consistent with Christ's words and deeds. He preached love and forgiveness for one's enemies. Even from the cross, he forgave those who put him there, i.e. all of us, the fallen and sinful humanity that we are. This is in stark contrast to the Mohammed who is proclaimed by Islam's religious authorities, both ancient and modern. Father Hamilton SJ. I would prefer scientific survey research, Australia wide, for assertions that Anti-Islam is "all the go" and other ensuing gratuitous generalizations re Anti Islamicism, among average Aussies today. Yes I suggest this, even as isolated pockets of such exist, and anti terrorist legislation appears being passed very soon through Parliament-eg, re internet terrorist skullduggery. Great article, ludicrous comments. Commenters want to believe the worst, and have 'researched' their answers from Anti-Islam websites, same tired old arguments get trotted out time and time again. I am appalled at the ignorance, and yes exactly the same sentiments that refused to allow Catholics the same rights, that expected Catholics to become 'white' and unfortunately, the high profile ones have become part of the hideous ruling elite. They betray us as Catholics, they are ignorant of our history, and they have lost that identity that Mannix cemented together. Ironically, it was only by his efforts that we established an educated Catholic class that enabled them to be in a position of power today. I am disgusted with them. I am disgusted at the ignorant rabble making their monstrous comments here, and the overtly racist 'aussies' now making life hell for Muslims. Racists have now emerged from under their rocks to torment Muslims because they have been sanctioned by our leaders. Andrew I have been thinking the same thing as you have written about for some time. Add also that our religious women wore distinctive clothing, that for many 'Micks' Ned Kelly was a freedom fighter and away we go. Thanks. Thanks Andrew for reminding us of the anti Catholic prejudice of yesteryear and its anti Protestant response from Catholics. And yes the recent anti Moslem attitudes being stirred up by our politicians is similar. Racism also follows the same pattern as has anti boat people propaganda. There are votes to be got in all of these. The targets are all presented as "evil". Such campaigns always arouse the latent prejudices within each of us. As followers of the man from Nazareth we have to learn to be tolerant understanding and just, recognise what's happening and refuse to be led. Thank you, John Ryan for introducing me to "Brother Rachid". By mistake I got on to Anti-Islam is the new Anti-Catholic. I will definitely pass on Brother Rachid to as many Christians as possible. An error in Wikipedia list of converts! Former President of Albania, Ramiz Alia,. as did former notorious president Enver Hoxha [Communist leader of Albania 1944-1985] remained an atheist communist. The latter officially declared Albania an atheist state. While Hoxha forbade and persecuted religion in Albania, destroying Mosques churches murdering priests and bishops, Ramiz Alia, under revolutionary pressure, ushered in anticommunist reforms. [Incidentally, Hoxha died in paranoid dementia in 1985] . In sweet Irony, while only 15 percent of the approximately three million inhabitants are Albanian Catholics, the vast majority are Muslims. Nevertheless, tens of thousands of people cheered the 77-year-old pontiff Francis during his one-day visit. Further the Pope considers Albania “for many countries a model on which they can orient”. Reason for this model is the coexistence of Muslims, Catholics and Orthodox without major conflicts. St John Paul visited in 1993. Thank you Margaret King and Father John George for further clarifications on this issue. A special thank you to Father Andrew Hamilton for detailing the malice which has often been used before for political gain (and distraction). It is not mere childish naivety to believe that talking to each other, sharing information and asking questions, will help break down the barriers built by those with vested interests. If the Catholic Church followed it's mandate seriously - and practiced it - there would be no need for communism and no need for armed uprisings by angry young men (IS) to step in to counteract the forces of greed and imperialism in the world. Thomas Aquinas wrote "Greed is a sin against God, just as all mortal sins, in as much as man condemns things eternal for the sake of temporal things." HH, the church is a vineyard - not a corporation, company or political party. The Pope has called for people to stop the type of divisive language typical in your comments. "Anti-Catholicism like anti-everything-else, still exists in pockets"[tut tut Fr Hamilton]. "Anti-Catholic assumptions have become deeply rooted among substantial sections of the public. Since the emergence of the new liberal anti-Catholicism in the late 1970s, a whole generation has grown up regarding these opinions as normal and customary, a familiar part of the social landscape for anyone born since about 1970. E.g bishops hate women and gays, priests molest children, and the Church supported the Holocaust: everybody knows that. These prejudices are particularly entrenched in the mass media, so powerfully that they are scarcely even recognized as prejudices. The ideas are in place, ready to be mobilized with very little provocation." I have picked up the Koran and read the first couple of pages. It goes to great lengths to profess that Jesus Christ is not the Son of God. I have a problem with this anti Christ attitude to the divinity of Christ. Perhaps this is where the problem lies. I am not aware of any other religion that preaches against Christ in its Religious texts, not in the Old testament, in buddist text or hindu texts or any other religious texts. Regrettably right on the target! About fifteen years ago I first began to teach graduate classes with quite a few students from Muslim countries. Discussions about different policy preferences were sometimes upset by what they heard being said about Islam. I thought I had heard some of this before. It brought back memories of common abuse hurled at Catholics, usually behind their backs, in the Protestant community in which I grew up. It was a relief when this nonsense stopped somewhere in the 1960s but dispiriting to see it return, just as virulently inappropriate, but with another target. As a practising dissenting Protestant in all but religious belief I am delighted that you have called this out. Extremely timely!! 100 years ago, when Catholics were widely described as "idolaters" and traitors owing alleigance to a foreign power (Rome), it would have been inconceivable for a Catholic to become prime minister. We need to tell the story of Catholic (and Protestant) integration, so that young Australian Muslims are not afraid to enter public service and ultimately to take the highest political office in the land. In an advanced society we have liberty and equality. Most of the worlds violence is caused by people treating other people not as their equals. Freedom must be defended if it comes under threat from political, religious , criminal or commercial tyrants. False ideas about Islamic teaching are still promulgated in these comments, despite the very sound article by Andrew Hamilton. Islam has no organized "church" and its name is at present being used by various interests. Muslim have to struggle against this.There is plenty of information out there which is not hate speech. John Morrow's book quoted below is one useful starting point. Morrow. John Andrew. The Covenants of the Prophet Muhammad with Christians of the World. Investigate the technique of "clerical honeypots" used by intelligence agencies.